I hear middle school has been rough lately. You have a hard enough time trying to navigate this delicate social universe when, in walks a mean girl sending out shock waves that rock your middle school world. What do you do? You are caught in the middle of being “polite”, because that is what you have been taught to do, and getting this mean girl off your back. It’s hard. I get it. Been there, done that. Are the kids still saying that? Here’s a life lesson, from your mom who has lived a looooonngg time: “Mean Girls” are not labels reserved for schoolyard meanies. Mean Girls don’t grow up…they just grow old. They become mean women. You’d think graduating high school would usher in a new way of thinking for them. You’d think these mean girls would leave their childish, tormenting, insecure ways behind and become instantly nice. Well, it’s not a switch that can be flipped into the “on” position. I wish. Mean girls grow up to be your neighbor, your boss, a parent on your child’s PTO, a family member, a co-worker, or a client that can’t be pleased not matter what. And guess what? They are still mean. I wish I could say that someday they wake up and become an encourager of everyone around them. I would be lying if I told you that. The truth is, a mean girl never goes away. You will be dealing with her for the rest of your life. That’s not to say that some mean girls haven’t changed their evil ways. I am sure there are some reformed mean girls living among us. I just haven’t met any…none that have admitted to being a recovering mean girl, anyway. Is it possible I could know them, even call them “friend”, and don’t know it? Maybe. Here’s something else to know. The more you surround yourself with real, authentic friends, the easier it will be to guard yourself against the mean girls no matter what life stage you are experiencing. Because real friends will support you, not bring you down. 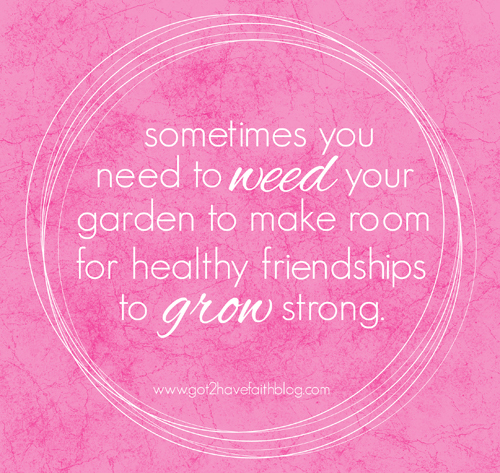 It is okay to “weed your garden” of a mean girl. Some days it might feel like a battlefield. It might feel like it’s you against a mean girl. But, don’t forget, you have an army of real friends who have your back. There is strength in numbers against mean girl. Their meanness is all about them. It’s not about you. It’s about their insecurities, home issues, low self-esteem, peer pressure, drama addiction, or whatever. Once you realize this, the less power they have over your emotions. I am not saying this will eliminate the sting of a mean girl. Sadly, that actually never changes. Even your old mother, with all her years of wisdom, can be hurt by the sting of a mean girl’s words or actions. But…it’s not about me, it’s about them and their issues. Your mom, who was once a 12-year-old fighting a mean girl battle. LINKING UP | Faith Barista WhiteSpace and Holley Gerth Coffee for your Heart. Read more encouraging women over at both of these wonderful, faith-filled blogs! Check out the new blog I just recently discovered: Messy Marriage, and link ups. I have grandsons that are facing bullies every day at school. You can not act on it like we did now days like we did 40 years ago. A good old” wrestling match on the play ground was how it got handled if you weren’t a hottie hottie. Which I never saw anyone ever get hurt. Just a push an shove before the teacher came an ever on ran. Meet me on the play ground does not work anymore. But kids didn’t quit playing with dolls before the we’re14. People are to thin skin these days an that goes for grown ups to. When people let God be taken out of everything that is what happens. We all are too thin skin. And the school doesn’t take real bullies seriously. So when a kid reacts to being bullied forever then it’s him who gets punished. Your boys are bullied and they react and learn from them.